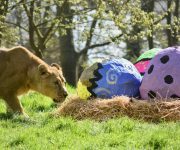 Kyra couldn’t believe her eyes this morning when she discovered the Easter bunny had left her an eggciting 13th birthday gift in her paddock overnight! 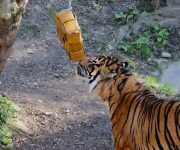 The birthday girl, alongside sister Asha, couldn’t wait to get stuck into the surprise enrichment Easter delivery of a giant straw nest full of huge papier mâché eggs. And as the … Continue reading Easter surprise! 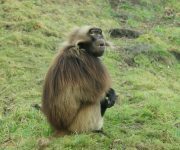 It’s a big day for a special little girl today as our first female baby gelada turns one! 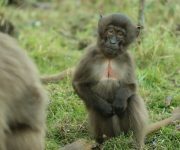 The birth of Kadida, the youngest of the breeding troop, finally broke our all-boy chain and we were so tickled pink about her arrival we invited our Facebook followers to choose her pretty name. 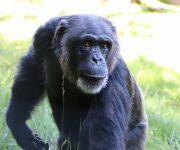 Senior Keeper, Jodie … Continue reading Kadida turns one! 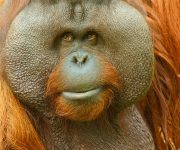 Happy Birthday to our handsome Bornean orangutan, Jorong, who turns 24 today! 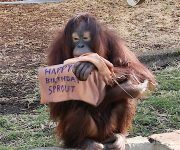 And keepers were planning to include celery, the alpha male’s favourite food, on the menu as well as giving him new sheets and blankets to play with on his special day. 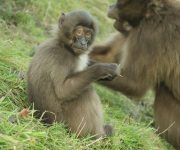 Upper Primates Section Leader Pat Stevens said: “Jorong has been with us … Continue reading Twenty-four today! 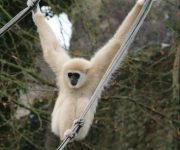 Dudley Zoo’s female giraffe Josie received a special birthday greeting today from a fellow 10-year-old who adopts her. 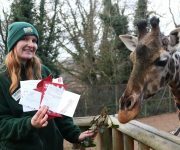 Adopter Hortense from London sent a birthday card for Josie’s 10th birthday which was beautifully illustrated with a sketch of her favourite giraffe. The card wished Josie the best day ever and Hortense also sent her a Christmas … Continue reading Josie hits double digits!